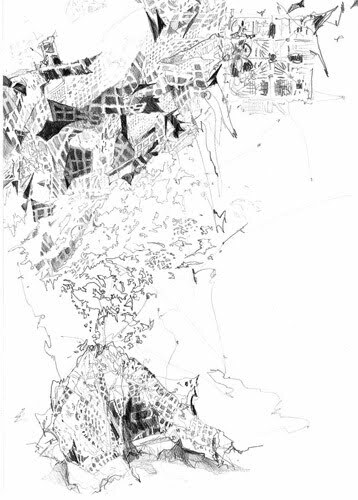 The “Inverted” exposition is a result of the Maess residential stay in Argentina and it consists of collection of drawings based on a unique topography of the city of La Plata. Maess treats the ideal city design with multiple transformations, violating exist­ing realities. An exploration of space between the starting point and the final result invites the viewer to embark on his/her own intellectual adventure of perception beyond the habitual lim­its. The artist’s key aim is not to reach a predetermined goal, but to observe the moments and places where imperfections and errors in the inversion process occur. Inversion can refer to a particular case of abstract thinking and can also be consid­ered a result of instinctive human penchant for putting con­trasting objects of concepts together. This kind of definition does not however allow to multiply all possible situations or circumstances and to adjust them to such thinking. Commonly used intuitive processes of inversion cannot always be reduced to a common denominator, since, for instance, contradiction such as good/evil is of different nature than day/night. Simple act of reverting inversion also does not lead to a zero sum situa­tion, but creates a web of transformations with varying interre­lations. Such manipulations can be best observed in visual arts – the most effective way of reaching a semantic or formal effect of surprise is to seek out the stubborn constant that hides in earlier solutions and invert it by 180 degrees. Maess (b.1982,Warsaw) graduated with a Master’s Degree from the Academy of Fine Arts in Warsaw. In 2005 she received a scholarship to attend the Escola Superior de Artes e Design in Porto Portugal. Then she had exhibitions, among all, in Poland, Portugal,Argentina,Italy,Spain and Germany. I simply want to say I am just newbie to blogging and truly liked your web page. Almost certainly I’m want to bookmark your blog . You certainly come with fantastic articles. Bless you for sharing with us your webpage. hello there and thank you for your info – I have certainly picked up something new from right here. I did however expertise several technical issues using this site, since I experienced to reload the website many times previous to I could get it to load properly. I had been wondering if your web hosting is OK? Not that I am complaining, but sluggish loading instances times will sometimes affect your placement in google and could damage your high quality score if advertising and marketing with Adwords. Anyway I am adding this RSS to my email and could look out for much more of your respective exciting content. Ensure that you update this again very soon..
ttrevkel,Waw! Its really great and wonderful ever i found. Thank you for sharing this info. fywwjxw,Hi there, just wanted to say, I liked this article. It was helpful. Keep on posting! I have to express my appreciation to you just for rescuing me from this particular setting. Right after looking throughout the internet and getting notions which are not beneficial, I believed my life was done. Being alive without the strategies to the difficulties you’ve fixed all through your main post is a serious case, and ones that could have badly damaged my entire career if I hadn’t discovered the blog. Your own competence and kindness in touching everything was tremendous. I’m not sure what I would have done if I had not come across such a point like this. I am able to at this point look forward to my future. Thanks a lot so much for the high quality and result oriented help. I won’t hesitate to endorse your site to any person who wants and needs support on this subject. Great ¡V I should definitely pronounce, impressed with your web site. I had no trouble navigating through all tabs and related information ended up being truly easy to do to access. I recently found what I hoped for before you know it at all. Reasonably unusual. Is likely to appreciate it for those who add forums or anything, web site theme . a tones way for your client to communicate. Excellent task.. I together with my guys happened to be taking note of the nice procedures found on the website and then came up with a terrible suspicion I had not thanked you for them. These guys are actually as a consequence very interested to learn all of them and already have in fact been making the most of those things. Many thanks for actually being considerably thoughtful and also for finding these kinds of nice topics millions of individuals are really desirous to understand about. My honest regret for not saying thanks to sooner. zcvaigh,Thanks for sharing this recipe with us!! Thanks for some other informative blog. The place else may just I get that kind of information written in such an ideal manner? I have a mission that I am just now operating on, and I have been at the look out for such info. Just desire to say your article is as surprising. The clearness in your post is just nice and i can assume you’re an expert on this subject. Fine with your permission let me to grab your RSS feed to keep up to date with forthcoming post. Thanks a million and please continue the gratifying work. I have been exploring for a little for any high-quality articles or blog posts in this kind of area . Exploring in Yahoo I at last stumbled upon this web site. Studying this info So i am satisfied to exhibit that I’ve an incredibly good uncanny feeling I discovered just what I needed. I such a lot indisputably will make sure to do not forget this website and give it a look on a continuing basis. “Does the host want to receive a novice gift bag now? ?” asked the little fairy, “Oh… that, little fairy, I still have some circles. You first introduce yourself first, by the way, introduce this creation of Xianting The system has something to do with it.” Qin Hengtian asked with a question. Just desire to say your article is as amazing. The clearness in your post is just nice and i can assume you are an expert on this subject. Well with your permission let me to grab your feed to keep up to date with forthcoming post. Thanks a million and please continue the rewarding work.